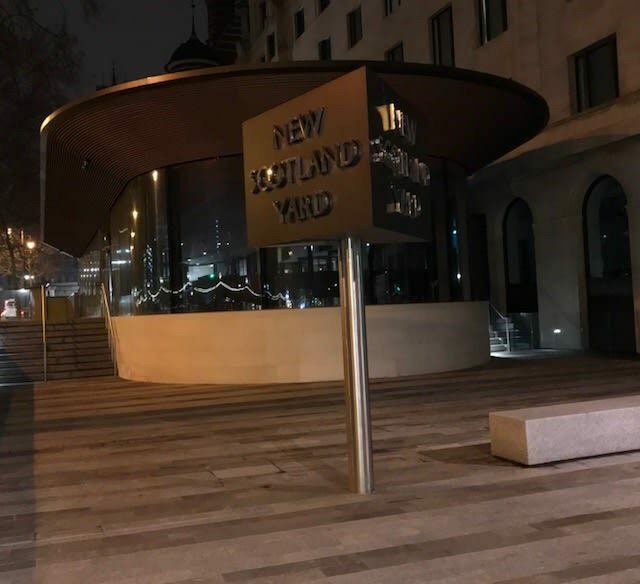 The Metropolitan Police Service took part in the global initiative of ‘Earth Hour’ and stopped it’s iconic revolving sign outside New Scotland Yard and switched off its lights where it was operationally feasible on Saturday, 24 March at 8.30pm. The Met is committed to reducing its carbon emissions associated with the running of its estate and its fleet, as well as minimising resource consumption, enhancing biodiversity, minimising waste and promoting a circular economy. As such, the iconic revolving sign was stopped from rotating and the lights in the pavilion of the smart new headquarters of New Scotland Yard were turned off for the hour. In doing so, the Met stood united with the global community in raising awareness of how each of us can reduce our impact on the environment, joining thousands of landmarks across the world including Buckingham Palace and Sydney Opera House. In its design and construction of New Scotland Yard, the building was awarded a BREEAM (Building Research Establishment Environmental Assessment Method) rating of excellent. This was for a number of sustainability measures that were incorporated into the design, in line with the MPS Sustainable Design Guide and MPS Environment Strategy.